Mike and I are the types that are always on the hunt for a new adventure. You know this about us. We aren’t very good at just being still, which we have learned to embrace. We also love to find activities that don’t involve a lot of clutter, noise, or anything too complicated. A few years back before leaving Michigan we got into paddleboarding. The lakes in Michigan are the perfect place to drop in a board and spend any part of your day on a board taking in the water. I have always wanted to surf, but I am not a fan of the ocean and what swims with you, so Paddleboarding seemed like my jam. The beauty of the water here is how crystal clear it is especially on a day where the wind is low. In many areas, you can see about 20 feet or more straight into the water. This makes for a fun paddle board ride to say the least. The last morning we were in Harbor Springs, Mike and I ate breakfast and decided it was a perfect morning to rent a paddleboard. 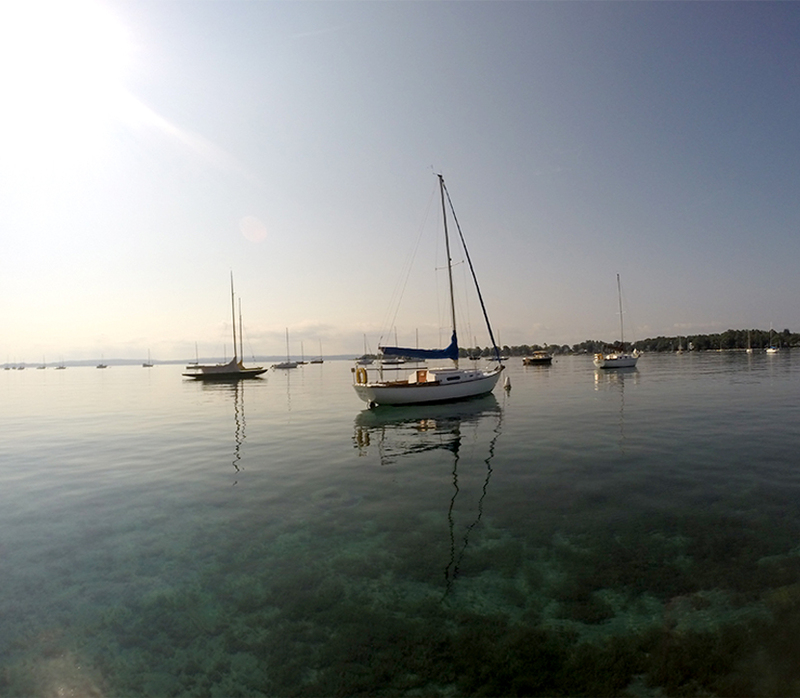 We headed to The Outfitter in downtown Harbor Springs and down to the water for a morning session. It was a Monday, which meant the traffic in the harbor was extremely minimal. Plus, the wind was low, and the sun was warm, so why not? We paid $66 for two boards and two hours on the water and they dropped the boards for us by Irish’s Marina and got on our boards and began paddling. We paddled south down the east side of the harbor by Wequetonsing. On the ride, we saw fish, old docks, moorings, and more. It was fun to explore the water that way. 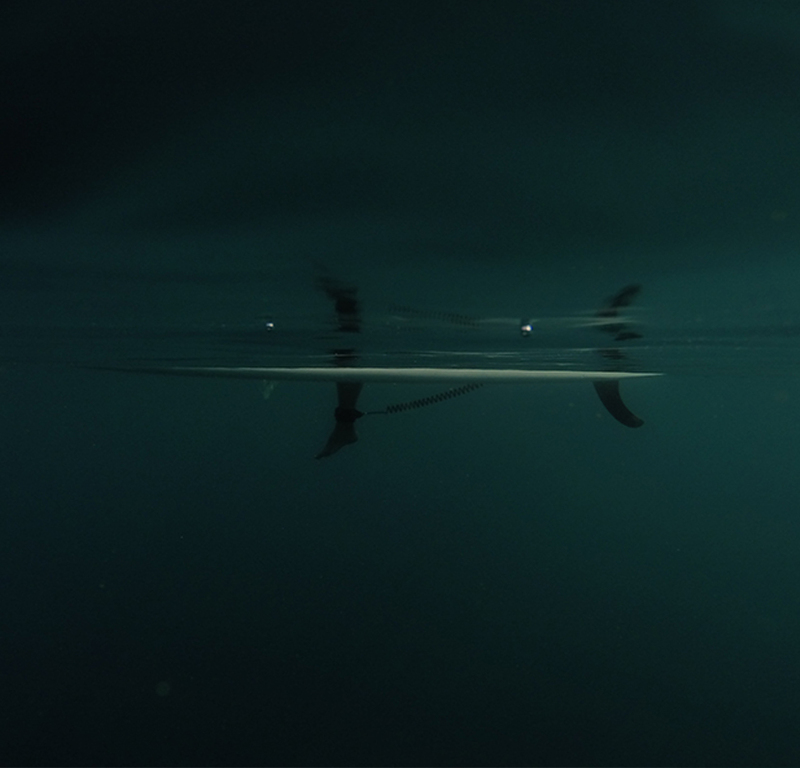 Many times you are in a boat or swimming, so it is hard to see anything below you in such an undisturbed way. 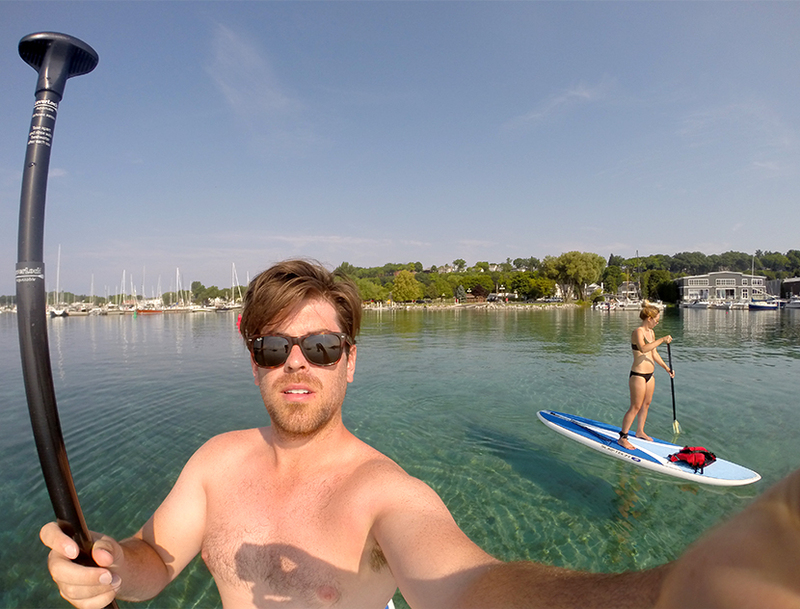 We paddled across the harbor over the deeper water, and Mike dropped the GoPro below and caught some cool shots under the water such as this one. The water felt fantastic on such a warm day that I just sit on the board and dipped my feet off the sides of the board and watched the wind on the water. It was so calm and beautiful I didn’t want it to end. Toward the end of our two hours with the boards, we came closer to the dock we dropped in at (about 12 feet deep in the area.) Mike wanted to take some video of us boarding in. He attached the camera to the bottom of the board and then thought it would be cool to swim under it. In the process, he knocked the camera off, and it fell to the bottom of the lake. This is where that crystal clear water comes in handy because we could see it, and 12 feet isn’t too deep to dive. So, after some coaxing Mike decided to go for it, and we recovered the camera. Just glad we got the camera back so we could share some of the images with you. I hope you had a good weekend. I spent most of it relaxing while Mike was away on Mille Mitten, but it was everything I needed as we head into our last full week up north. I would love to hear if you have gone paddle boarding or not before? Where did you go? If you are in Harbor Springs, we highly suggest The Outfitter. Their team was great and helpful. We also really loved the boards we were on. Great shots! I love paddleboarding. I got into it last summer and have been doing it about once a week this season. I enjoy exploring new channels and bodies of water. You’re right–it’s such a unique way to see the water! I love ending my paddleboard session by just sitting and lettIng the current take me where it may. It’s DEFINITELY something i miss come fall. Looks like a ton of fun! I’d just be a little too afraid that my clumsy self would spend more time in the water than on the board. Haha. Love it, it’s The nearest thing to walking on water. I LEARNED ON LAKE INDIANWOOD IN LAKE ORION SEVERAL years ago. I FOUND IT TO BE VERY EASY TO LEARn. So peaceful yet a great core workout. Paddleboarding is so much fun! I’ve borrowed a friend’s at a lake house in Indiana, and rented one on vacation in Florida. As a yoga instructor, I loved trying my hand at SUP yoga. I’m convinced that I want to find a house near water where I can invest in a paddleboard.